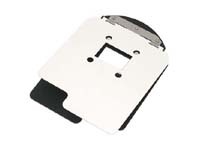 Spring-hinged rapid shift type glassless 35mm format negative carrier for use in Omega C-67 Condenser and Super Chromega C Dichroic enlargers. These carriers are used and have minor cosmetic marks from previous use, but are in perfect working condition. The image opening has not been filed out or modified from original.